2. Add salt, pepper and 2 tblsp water. 4. In a separate bowl, mix the shrimps, cheese and tomatoes. 6. Heat butter in a nonstick pan over medium flame. 7. Pour the egg mixture and tilt the pan to allow the mixture to spread. 9. Add 1 or 2 tblsp of the shrimp mixture to the omelette. 10. Fold and cook for 30 to 45 seconds. 11. Transfer to a serving plate. 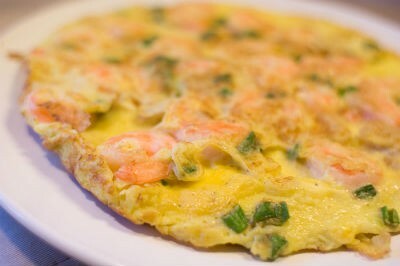 Feel free to comment or share your thoughts on this Shrimp Omelette Recipe from Awesome Cuisine.